We offer these following chicken feed recipes as a road map for poultry owners who wish to grow and/or blend their own feeds. To our knowledge, we are the only website which offers such a wide collection of recipes, and we hope that flock owners find them helpful. However, before we get started, I first want to list some caveats to the list and why poultry owners need to proceed carefully. First, I was very surprised to find that there were so few sources of information for proven chicken feed recipes available online. And I should clarify what I mean by "proven". Type in the search term "best chicken feed recipes" and a long list will come up. The vast majority of those recipes are from individuals who have put those recipes together for their own flocks, without giving the reader much proof that the rations are working well. For instance, they don't provide information about whether their flocks are laying well, living long productive lives, staying healthy, providing profitable returns, etc. We also don't know how much those folks are paying for those rations. While researching the topic of chicken feed recipes, quite a few of the homemade recipe websites stated right up front that they were more expensive than store-bought, but the flock owner wanted to provide those feeds for whatever reason. Or, the flock owner didn't know how much the recipe ingredients actually cost, because the flock owner was already growing those feeds as part of a garden. Or they wanted to offer their birds a wide variety of feeds, but had no idea if the balance actually met all the nutrient requirements. In other words, a lot of chicken feed recipes might look good on paper, and might taste good to the birds, but we have no idea (from the information provided) about how well those feeds will work in other situations. So I have tried to restrict the information here, to only listing those feeds which do have a great deal of either testing and/or experimentation work behind them to show that they are a reliable, nutritious, cost-effective ration. That typically means recipes from non-profit organizations, research groups like land grant universities and/or county extension offices, etc. One possible reason is that folks simply aren't interested. I found that hard to believe. Consumer interests in, and concerns about, their food safety have never been higher. Similarly, producer interest in how to feed their birds safely and cost-effectively is also high. Folks asking for chicken feed recipes has never been higher in places like Facebook groups, Yahoo groups, and poultry enthusiast forums. Another possible reason is that the information is proprietary, and thus companies don't want to share. That is also hard to believe. Poultry feed recipes have been available publicly in print form for almost 100 years. While research advances will continue to modify and refine those combinations, the fundamentals haven't changed much in that 100 years. The third possibility is that the subject is simply so complex, that authors haven't wanted to wade through the options and propose reliable chicken feed recipes. A variant on that theme is that those who have the knowledge to provide guidance on what makes the best chicken feed recipes, are doing research and writing books on the matter, rather than writing websites. While this possibility doesn't quite add up either, I think it's probably the most likely explanation. While poultry nutrition research continues, most of that work is being done at land grant universities and/or through poultry feed companies. So the latest and greatest updates are being published in academic peer-review journals, and the results woven into commercially available feeds. Since those feed recipes are proprietary, they are protected. And most poultry owners don't read academic peer-review journals. Meanwhile, those of us owners, growers and Extension staff members are much too busy with all our other tasks to also develop new chicken feed recipes from that research. So what's a flock owner to do? For that matter, what's a dedicated flock owner (or small farm business website owner) to do? We step back a few paces from the newest research, and look at what we already know from past research. So that's what I've done below - I've provided the best chicken feed recipes I could find from proven sources, developed a number of years ago, but still performing well in the field. These recipes have been worked out over many generations, by a number of qualified individuals – typically researchers at agricultural universities, working in conjunction with regional flock owners. Also note that not all ingredients will be available in all locations, or at cost-effective prices. These recipes were developed for various regions, to make the most of what is or was traditionally available in that region at low cost. Finally, note that while many of these recipes would seem open to “tweaking”, the amounts and ratios were very carefully worked out both experimentally and in repeated real-world settings. The ratios in most cases are not based solely on cost-effectiveness, but also on the quantities and combinations of various nutrients. For instance, some ingredients offer one or more desirable nutrient profile, but can only be used in limited quantities because of the presence of other substances which have negative effects if present in high enough quantities. For instance, peas have a nice protein profile for birds, but also contain digestive inhibitors. Thus it should only be included up to 50% of the total ration to provide that protein, without disrupting the digestion in the process. All that preamble behind us, we are happy to offer the following variety of chicken feed recipes. Our intention is that if some materials in one recipe are unavailable, flock owners can use another recipe with ingredients that are more readily available. With each recipe, I have provided the source for that recipe and a bit more about why that source can be relied upon as trustworthy. We hope that these recipes serve our fellow flock owners well. Morrison's Feeds & Feeding has been the single most popular textbook for college level livestock nutrition, for most of the last century. First published in 1898, the textbook went through at least 21 editions in the first half of the 20th century, with each new edition providing newly revised recommendations for all classes of livestock. The two versions that I draw from are the 20th and 21st editions, published in 1936 and 1951, respectively. At some point after that 21st edition, the book went through a large enough revision that the edition numbering started over again, such that an eighth edition was published in the late 50's and a ninth edition published in 1961. Most folks who have gone through any sort of college-level livestock nutrition class, will have encountered Morrisons as part of that education. I specifically searched out my earlier versions of this book, for two reasons. First, the years after WWII marked some dramatic shifts in American agriculture, amongst them an increased reliance on buying in feed raised some distance away, rather than raising it on the farm or buying it locally. Secondly, feedstocks which had previously never been considered, were suddenly attractive to industrial livestock production. This is because American chemical industry had come far enough along to process those feedstocks into edible forms, in bulk quantities for feedlot and factory farming purposes. So later editions of Morrisons reflected those changes in philosophy, and focused on providing detailed information on how to use those materials. I already knew I was primarily interested in locally grown feeds for small-scale livestock production, so that latter information was less important to me. Given that preamble, I have transcribed all the recipes out of the 21st Edition of Morrison's Feeds & Feeding, and provided them below. More specifically, these recipes are available on pages 1182 through 1184 of that edition. Fertrell is a major supplier of feed supplements for both small-scale and large commercial poultry operations. One of their nutritionists has recently written a book on feeding pastured birds, called . The Fertrell website also provides three poultry rations: a chick starter ration, a layer ration and a meat bird ration. Those recipes are all available on their website. While some could criticize their recipes as merely a platform for selling their supplements, those recipes are one of the best ways to use currently available materials, plus a single bought-in supplement, to provide a very well balanced ration. 3) sometimes flock owners will use ingredients from their own farms and gardens which are available for such a short window of time (for instance, garden trimmings or seasonal produce) that they cannot be listed as a year-round option, yet which provide solid nutritional value. I must say here that I make no warranty as to how complete these diets are. Undoubtedly they offer some nutrients in abundance and may be lacking in others. Yet these recipes have worked, and continue to work, for those owners. Using these recipes as a base, and reading at least some of the additional resources I'll provide, flock owners can assemble their own recipes which works well enough. 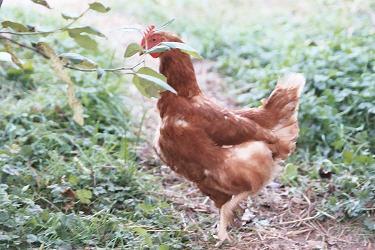 BackyardChickens.com has a running forum thread called Feeding Laying Hens, where forum members share their current feeding regimen. The Lionsgrip website seems devoted to poultry, even though the URL is named for a completely unrelated product. I hesitated to include it here due to that naming issue, but frankly the pages offered so much information from so many sources, I decided to let the reader decide if it was worthy of pursuit. It looked like decent information, with several layer rations from an unnamed nutritionist, several recipes from older books, information about specific ingredients, and the owner's own experiences. This 1975 Mother Earth News article provides a pretty good overview of a small-scale flock owner's options for a home-grown or locally-sourced diet for a layer flock. To paraphrase Yoda the Jedi Master, "always in motion, is the world of nutrition." Research on poultry nutrition continues to this day. My own research into cost-effective options for flock owners will also continue. As I find those additional sources of information, I'll share them here. Until then, read as much as possible, and offer different things to the birds, see how they do, and take notes. Ultimately, the birds will be the ones to decide what works and what doesn't.